This week's prompt from Tess @ Magpie Tales is a fairly familiar image, so it took me a while to work out where to go with it. In the end, I decided to do a small piece on two teenagers from Dublin (Ireland) visiting the Mona Lisa in the Louvre on a school trip. Apologies to anyone that might have difficulty with the local dialect, and also for the sentence alignment, for some reason the tabs were acting up and no matter what I did, they just sat a little odd. For other interpretations of this week's prompt visit Magpie Tales HERE. Steve: Wat do ya want to come in here for? Amy: To see her eyes. They say dat her eyes follow ya all around the room. Me Grandad said dat when he was here, when he was young like, dat he just had to come and check her out, see if the thing wit her eyes was really true. Steve: Was he here during the war? Amy: Nah. Him and his friend Archie, they wer over for a match, some French team and Manchester United. Amy: He went to all four corners of the room he did, and der they wer, da eyes as sure as anythin', staring him out of it. Amy: Mona’s eyes ya dope. Steve: Yeah? Followin' him around like? Amy: They wer lookin’ at him, no matter wer he stood. Steve: He could have turned his back on her. That wud hav made it trickier. Amy: Leonardo was a ‘genius’ Steve, not a bleedin’ magician. Amy: Wat? Not the movie star you thick. 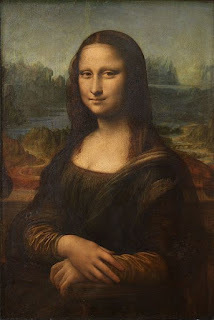 Leonardo Da Vinci, the guy dat painted herself. Some say she's a man, Mona dat is. Steve: A wat? You’re not serious. Though now dat I'm lookin' at her, she does look sorta odd, ya know, like one of them faces dat they stick into somethin' else. Amy: Nah. She, I mean he, doesn't look like dat. Sorry Mona. Steve: Wat are ya sayin’ sorry to a blinkin’ paintin’ for? Amy: In case der is a bit of a magician in her after all. Steve: Oh right. Yeah ya might hav’ somethin’ der. Steve: Well I don’t like it here. Amy: Why not? I think it’s great, beats bein’ in bleedin’ school anyhow. Steve: Yeah, well I thought when they said we wer going to Paris, dat it wud be Euro Disney, not all this posh stuff (he looks around him). Steve: It’s like visitin’ another world. Amy: Wat wrong wit dat? Steve: It’s a bit bleedin’ scary. Steve: Yeah, like all these paintins’ and all. Steve: I don’t think she’s da only one dats lookin’ at us. Amy: Ah Steve, are they really scarin’ ya? Don’t ya worry. I'll mind ya. I like a guy with a bit of a soft side (she links his arm). Steve: Hey, there’s Miss Brennan. Amy: Miss Brennan. Howya (she waves). Miss, we're over here. Sorry Miss. Steve here just wanted to see Mona. Didn't ya Steve? Come on will ya, before Miss Brennan has a heart attack. Steve: Dats right, land me in it why don’t ya. Amy: Keep it down Steve. Did I not tell ya? Amy: Your woman Mona, she can hear as well. Steve: (shaking) You're not serious. Amy: Come on. Don't worry, didn't I say dat I wud mind ya. Wonderful story from start to finish. Terrific story here, Socks. I enjoyed it very much. I'm new here through Dave's blog, a writer, too but not a novelist. I'm too much into non-fiction to manage the demands. Pleased to meet you. Glad you both liked it April and Elisabeth, and welcome to 120 socks. I enjoyed that a lot. I have no idea what I'm going to write. Sigh. Ha ha! Terrific dialogue (maybe she can hear; never thought of that). Very nice magpie. Thank you for stopping by the window and leaving a bit of yourself there. I like your "socks" and see that we have quite a few bloggy friends in common. Thanks for visiting ds, and yes earlybird the accent can be difficult, a bit like seeing text language for the first time! I really enjoyed this! I'd love to see a movie short with Amy and Steve in this scene-it would be a hoot! Do Amy and Steve really exist...they seem so real. A good write! Hi Lolamouse, yes the two of them would make a great movie short, you could have such fun with them! Thanks Elaine,they are as real as my imagination I guess!!! clever take on Mona Lisa- I enjoyed the dialect of the two teenagers! Clever, good use of voices, nice sidetake on Lisa. This is awesome...great writing 120 socks!! Great idea well worked into the convincingly semi-literate dialogue of modern "yoof`"
"Leonardo Da Vinci, the guy dat painted herself." It's that use of "herself" that I find so charming! Thanks Carrie and Docter FTSE, and yes Lydia, it is open to a couple of interpretations indeed! Excellent write. Thoroughly enjoyed it.